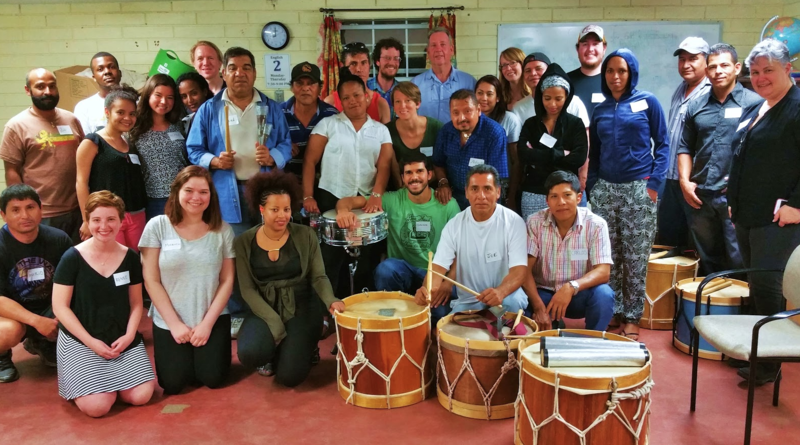 We had a blast at the recent percussion workshop given during ESL class by Bruno Vinezof. The purpose was for Bruno to share his culture by bringing music and dance to the residents of Casa Marianella, generic providing a fun way for residents to release the stress of the day and begin to learn a new skill. Bruno taught the basics of two rhythms, medical afoxé and coco, there through dance steps and percussion instruments. Bruno is from the state of Pernambuco in northeast Brazil where these rhythms originate. 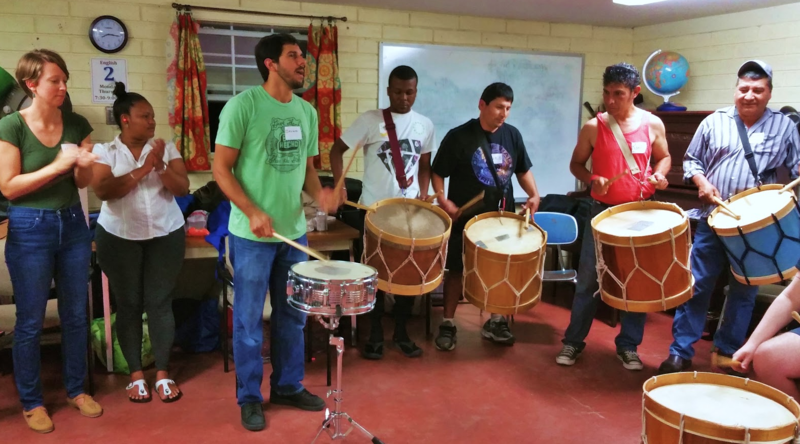 He is the founder and leader of Maracatu Texas, a community percussion group here in Austin. Maracatu Texas plays rhythms of northeastern Brazil, including afoxé and coco as well as maracatu. He is also the founder of the band Forro de Quintal (they play “forro” another type of music from N.E. Brazil) and plays with many other local musicians on a regular basis. Our residents had a very special evening at this workshop, and we are very thankful for Bruno coming out to bring such joy to Casa. Although a bit timid at first, the residents soon warmed up and started playing the instruments and stepping to the rhythms, most people could not hold back smiles and laughter. Casa Marianella residents and community members (who normally come to ESL) were in attendance, as well as current staff and former staff. We had such a joyous evening, and look forward to more exciting events like this! Have an idea for a special event like this? Reach out to casamarianellamarketing@gmail.com to tell us about it!